Here’s an inexpensive Valentine’s Day gift that you can make yourself for that special someone. We provide the free, full-sized rose stencil pattern (at right) – or you could use your own romantic theme. Either way, a mug that you paint yourself is sure to please! Purchase an inexpensive glass coffee mug or use a solid white one that you may already have around. Clean the mug well with dishwashing liquid and water, then rinse and dry thoroughly. With a paint brush, brush on the surface conditioner. You must let this dry, but you can usually paint on your design within an hour. You can purchase stencil paper that is specifically manufactured for making your own stencils, but why not save the money and use plain paper and tape? Print out the pattern, put wide tape on both sides of the paper pattern, then cut out using sharp cuticle scissors or an exacto craft knife. Put the stencil in position on the mug (not too close to the top) and keep it in place with spray stencil glue, or tape it firmly in place. Use a makeup sponge to sponge the paint colors on the stencil. You will need two coats of paint. 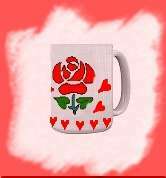 Make another stencil on the other side of the mug handle so that you have a picture on both sides of the mug. If you wish, try painting some small hearts at the bottom as a border, as well as down the stem of the handle. Check the manufacturers instructions when applying paint, particularly if you are using paint on an object that will be used for serving food or drinks. Most paints should not be applied close to the lip of a cup, for instance – so please make sure you read the bottle label carefully.